The Senate attached hate crimes legislation to a must-pass Pentagon spending bill Thursday, but opponents predicted it ultimately would fail. The Democratic-controlled House passed the same hate crimes legislation as a stand-alone bill earlier this year despite Bush's veto threat. That makes a repeat of 2004, when the Senate passed a similar amendment to the same bill only to see it stripped out during negotiations with the Republican-led House, less likely this time around. President Bush, who says the bill is not needed, could then be faced with vetoing the vast defense authorization bill containing the same provision. The White House had no immediate comment Thursday. 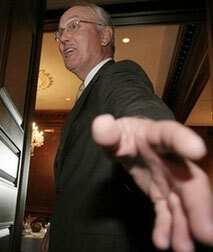 Notably, Sen. Larry Craig (R-ID) voted against the legislation. UPDATE: See the full roll call here.